With: Adelheid Heftberger, Agatha Man, Alex Avrorin, Bertrand Grandgeorge, Bob Li, Chanda L. Carey, Christa Lee, Christine Pham, Colin Wheelock, Daniel Rehn, Devon Merill, Jia Gu, Kedar Reddy, Laura Hoeger, Michael Briganti, Nichol Bernardo, Ong Kian Peng (aka Bin), Rachel Cody, Sergie Magdalin, So Yamaoka, Steven Mandiberg, Sunsern Cheamanunku, Tara Zepel, Victoria Azurin, Xiangfei Zeng, Xiaoda Wang. Film screening and closing reception: December 3, 2010. This fall, the gallery@calit2 presents "Mapping Time," an exhibition by the Software Studies Initiative. 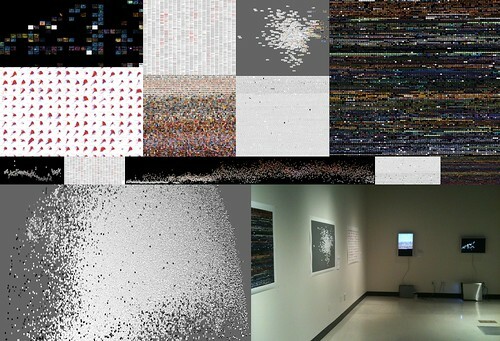 Since 2008, the Software Studies Initiative has focused on the development of new methods and techniques for the analysis and visualization of visual and interactive media. The exhibition coincides with the lab releasing a number of open-source tools which were used to create all works in the exhibition. The lab is directed by Lev Manovich, UCSD Professor of Visual Arts and Calit2 researcher; its core participants are Jeremy Douglass (Calit2 post-doctoral researcher) and William Huber (PhD candidate in visual arts). In addition, undergraduate and graduate students and faculty from the departments of Electrical and Computer Engineering, Computer Science and Engineering, Communication, Visual Arts, the Center for Research in Computing and the Arts, and Calit2 participate in the lab's work. The lab uses the term Cultural Analytics to refer to its techniques for the analysis and visualization of large cultural data sets. For the "Mapping Time" exhibition, the concept is to render the "shapes" of cultural time. According to Manovich, "our goal is to demonstrate how we can visualize gradual changes over time at a number of scales - from a single minute of a video game play, to 11 years of the popular manga title Naruto, to 130 years of the journal Science (1880-2010).” The exhibition includes visualizations of novels, video game play, web comics, manga, motion graphics, feature films, and mass media publications such as Time magazine presented via large-scale prints, animations and real-time generative projections. Software Studies Initiative research is supported by Calit2, CRCA, UCSD, the NEH Office of Digital Humanities and NSF. Software Studies Initiative contact: William Huber <whuber@ucsd.edu>. Calit2 media contact: Doug Ramsey <dramsey@ucsd.edu>.